Atmospheric hypoxia occurs naturally at high altitudes. Total atmospheric pressure decreases as altitude increases, causing a lower partial pressure of oxygen which is defined as hypobaric hypoxia. Oxygen remains at 20.9% of the total gas mixture, differing from hypoxic hypoxia, where the percentage of oxygen in the air (or blood) is decreased. This is common, for example, in the sealed burrows of some subterranean animals, such as blesmols. Atmospheric hypoxia is also the basis of altitude training which is a standard part of training for elite athletes. Several companies mimic hypoxia using normobaric artificial atmosphere. 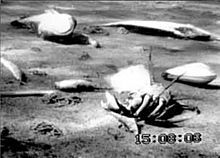 Oxygen depletion is a phenomenon that occurs in aquatic environments as dissolved oxygen (DO; molecular oxygen dissolved in the water) becomes reduced in concentration to a point where it becomes detrimental to aquatic organisms living in the system. Dissolved oxygen is typically expressed as a percentage of the oxygen that would dissolve in the water at the prevailing temperature and salinity (both of which affect the solubility of oxygen in water; see oxygen saturation and underwater). An aquatic system lacking dissolved oxygen (0% saturation) is termed anaerobic, reducing, or anoxic; a system with low concentration—in the range between 1 and 30% saturation—is called hypoxic or dysoxic. Most fish cannot live below 30% saturation. Hypoxia leads to impaired reproduction of remaining fish via endocrine disruption. A "healthy" aquatic environment should seldom experience less than 80%. The exaerobic zone is found at the boundary of anoxic and hypoxic zones. Hypoxia may also occur in the absence of pollutants. In estuaries, for example, because freshwater flowing from a river into the sea is less dense than salt water, stratification in the water column can result. Vertical mixing between the water bodies is therefore reduced, restricting the supply of oxygen from the surface waters to the more saline bottom waters. The oxygen concentration in the bottom layer may then become low enough for hypoxia to occur. Areas particularly prone to this include shallow waters of semi-enclosed water bodies such as the Waddenzee or the Gulf of Mexico, where land run-off is substantial. In these areas a so-called "dead zone" can be created. Low dissolved oxygen conditions are often seasonal, as is the case in Hood Canal and areas of Puget Sound, in Washington State. The World Resources Institute has identified 375 hypoxic coastal zones around the world, concentrated in coastal areas in Western Europe, the Eastern and Southern coasts of the US, and East Asia, particularly in Japan. Scientists have determined that high concentrations of minerals dumped into bodies of water causes significant growth of phytoplankton blooms. As these blooms are broken down by bacteria, such as Phanerochaete chrysosprium, oxygen is depleted by the enzymes of these organisms. Oxyferroheme is converted to Ferri-LiP with the addition of veratric alcohol, and gives off diatomic oxygen radical. This is the breakdown of a confieryl alcohol by a hydrogen ion to make propanol and ortho-methoxyphenol. Ligninperoxidase (LiP) serves as the most import enzyme because it is best at breaking down lignin in these organisms. LiP disrupts C-C bonds and C-O bonds within Lignin’s three-dimensional structure, causing it to break down. LiP consists of ten alpha helices, two Ca2+ structural ions, as well as a heme group called a tetrapyrrol ring. Oxygen serves an important role in the catalytic cycle of LiP to form a double bond on the Fe2+ ion in the tetrapyrrol ring. Without the presence of diatomic oxygen in the water, this breakdown cannot take place because Ferrin-LiP will not be reduced into Oxyferroheme. Oxygen gas is used to reduce Ferrin-LiP into Oxyferroheme-LiP. Oxyferroheme and veratric alcohol combine to create oxygen radical and Ferri-LiP, which can now be used to degrade lignin. Oxygen radicals cannot be used in the environment, and are harmful in high presence in the environment. 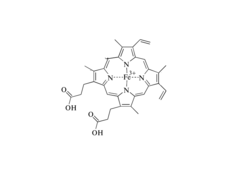 Once Ferri-LiP is present in the ligninperoxidase, it can be used to break down lignin molecules by removing one phenylpropane group at a time through either the LRET mechanism or the mediator mechanism. The LRET mechanism (long range electron transfer mechanism) transfers an electron from the tetrapyrrol ring onto a molecule of phenylpropane in a lignin. This electron moves onto a C-C or C-O bond to break one phenylpropane molecule from the lignin, breaking it down by removing one phenylpropane at a time. In the mediator mechanism, LiP enzyme is activated by the addition of hydrogen peroxide to make LiP radical, and a mediator such as veratric alcohol is added and activated creating veratric alcohol radical. Veratric alcohol radical transfers one electron to activate the phenylpropane on lignin, and the electron dismantles a C-C or C-O bond to release one phenylpropane from the lignin. As the size of a lignin molecule increases, the more difficult it is to break these C-C or C-O bonds. Three types of phenyl propane rings include coniferyl alcohol, sinapyl alcohol, and-coumaryl alcohol. LiP has a very low MolDock score, meaning there is little energy required to form this enzyme and stabilize it to carry out reactions. LiP has a MolDock score of -156.03 kcal/mol. This is energetically favorable due to its negative free energy requirements, and therefore this reaction catalyzed by LiP is likely to take place spontaneously. Breakdown of propanol and phenols occur naturally in the environment because they are both water soluble. The breakdown of phytoplankton in the environment depends on the presence of oxygen, and once oxygen is no longer in the bodies of water, ligninperoxidases cannot continue to break down the lignin. When oxygen is not present in the water, the breakdown of phytoplankton changes from 10.7 days to a total of 160 days for this to take place. In this equation, G(t) is the amount of particulate organic carbon (POC) overall at a given time, t. G(0) is the concentration of POC before breakdown takes place. k is a rate constant in year-1, and t is time in years. For most POC of phytoplankton, the k is around 12.8 years-1, or about 28 days for nearly 96% of carbon to be broken down in these systems. Whereas for anoxic systems, POC breakdown takes 125 days, over four times longer. It takes approximately 1 mg of Oxygen to break down 1 mg of POC in the environment, and therefore, hypoxia takes place quickly as oxygen is used up quickly to digest POC. About 9% of POC in phytoplankton can be broken down in a single day at 18 °C, therefore it takes about eleven days to completely break down a full phytoplankton. After POC is broken down, this particulate matter can be turned into other dissolved organic carbon, such as carbon dioxide, bicarbonate ions, and carbonate. As much as 30% of phytoplankton can be broken down into dissolved organic carbon. When this particulate organic carbon interacts with 350 nm ultraviolet light, dissolved organic carbon is formed, removing even more oxygen from the environment in the forms of carbon dioxide, bicarbonate ions, and carbonate. Dissolved inorganic carbon is made at a rate of 2.3-6.5 mg/(m^3)day. As phytoplankton breakdown, free phosphorus and nitrogen become available in the environment, which also fosters hypoxic conditions. As the breakdown of these phytoplankton takes place, the more phosphorus turns into phosphates, and nitrogens turn into nitrates. This depletes the oxygen even more so in the environment, further creating hypoxic zones in higher quantities. As more minerals such as phosphorus and nitrogen are displaced into these aquatic systems, the growth of phytoplankton greatly increases, and after their death, hypoxic zones are formed. To combat hypoxia, it is essential to reduce the amount of land-derived nutrients reaching rivers in runoff. This can be done by improving sewage treatment and by reducing the amount of fertilizers leaching into the rivers. Alternately, this can be done by restoring natural environments along a river; marshes are particularly effective in reducing the amount of phosphorus and nitrogen (nutrients) in water. 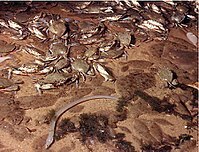 Other natural habitat-based solutions include restoration of shellfish populations, such as oysters. Oyster reefs remove nitrogen from the water column and filter out suspended solids, subsequently reducing the likelihood or extent of harmful algal blooms or anoxic conditions. Foundational work toward the idea of improving marine water quality through shellfish cultivation was conducted by Odd Lindahl et al., using mussels in Sweden. More involved than single-species shellfish cultivation, integrated multi-trophic aquaculture mimics natural marine ecosystems, relying on polyculture to improve marine water quality. In a very short time the oxygen saturation can drop to zero when offshore blowing winds drive surface water out and anoxic depth water rises up. 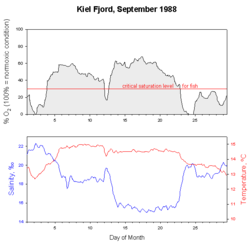 At the same time a decline in temperature and a rise in salinity is observed (from the longterm ecological observatory in the seas at Kiel Fjord, Germany). New approaches of long-term monitoring of oxygen regime in the ocean observe online the behavior of fish and zooplankton, which changes drastically under reduced oxygen saturations (ecoSCOPE) and already at very low levels of water pollution. ^ Brandon, John. "The Atmosphere, Pressure and Forces". Meteorology. Pilot Friend. Retrieved 21 December 2012. ^ "Dissolved Oxygen". Water Quality. Water on the Web. Archived from the original on 13 December 2012. Retrieved 21 December 2012. ^ Roper, T.J.; et al. (2001). "Environmental conditions in burrows of two species of African mole-rat, Georychus capensis and Cryptomys damarensis". Journal of Zoology. 254 (1): 101–107. doi:10.1017/S0952836901000590. ^ Rabalais, Nancy; Turner, R. Eugene; Justic´, Dubravko; Dortch, Quay; Wiseman, William J. Jr. Characterization of Hypoxia: Topic 1 Report for the Integrated Assessment on Hypoxia in the Gulf of Mexico. Ch. 3. NOAA Coastal Ocean Program, Decision Analysis Series No. 15. May 1999. < http://oceanservice.noaa.gov/products/hypox_t1final.pdf >. Retrieved February 11, 2009. ^ a b c d e Gubernatorova, T. N.; Dolgonosov, B. M. (2010-05-01). "Modeling the biodegradation of multicomponent organic matter in an aquatic environment: 3. Analysis of lignin degradation mechanisms". Water Resources. 37 (3): 332–346. doi:10.1134/S0097807810030085. ISSN 0097-8078. ^ Betteridge, D. John (2000). "What is oxidative stress?". Metabolism. 49 (2): 3–8. doi:10.1016/s0026-0495(00)80077-3. ^ Chen, Ming; Zeng, Guangming; Tan, Zhongyang; Jiang, Min; Li, Hui; Liu, Lifeng; Zhu, Yi; Yu, Zhen; Wei, Zhen (2011-09-29). "Understanding Lignin-Degrading Reactions of Ligninolytic Enzymes: Binding Affinity and Interactional Profile". PLOS ONE. 6 (9): e25647. doi:10.1371/journal.pone.0025647. ISSN 1932-6203. PMC 3183068. PMID 21980516. ^ Harvey, H. Rodger (1995). "Kinetics of phytoplankton decay during simulated sedimentation: Changes in biochemical composition and microbial activity under oxic and anoxic conditions". Geochimica et Cosmochimica Acta. 59 (16): 3367–3377. doi:10.1016/0016-7037(95)00217-n.
^ Jewell, William J. "Aquatic Weed Decay: Dissolved Oxygen Utilization and Nitrogen and Phosphorus Regeneration". Journal - Water Pollution Control Federation. 43: 1457–1467. ^ Johannessen, Sophia C.; Peña, M. Angelica; Quenneville, Melanie L. (2007). "Photochemical production of carbon dioxide during a coastal phytoplankton bloom". Estuarine, Coastal and Shelf Science. 73 (1–2): 236–242. doi:10.1016/j.ecss.2007.01.006. ^ Conley, Daniel J.; Paerl, Hans W.; Howarth, Robert W.; Boesch, Donald F.; Seitzinger, Sybil P.; Havens, Karl E.; Lancelot, Christiane; Likens, Gene E. (2009-02-20). "Controlling Eutrophication: Nitrogen and Phosphorus". Science. 323 (5917): 1014–1015. doi:10.1126/science.1167755. ISSN 0036-8075. PMID 19229022. ^ Lindahl, O.; Hart, R.; Hernroth, B.; Kollberg, S.; Loo, L. O.; Olrog, L.; Rehnstam-Holm, A. S.; Svensson, J.; Svensson, S.; Syversen, U. (2005). "Improving marine water quality by mussel farming: A profitable solution for Swedish society". Ambio. 34 (2): 131–138. CiteSeerX 10.1.1.589.3995. doi:10.1579/0044-7447-34.2.131. PMID 15865310. Fischer P.; U. Kils (1990). "In situ Investigations on Respiration and Behaviour of Stickleback Gasterosteus aculeatus and the Eelpout Zoaraes viviparus During Low Oxygen Stress". International Council for the Exploration of the Sea. C M 1990/F:23. 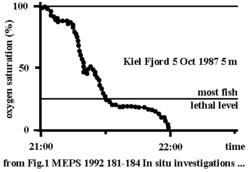 Fischer P.; K. Rademacher; U. Kils (1992). "In situ investigations on the respiration and behaviour of the eelpout Zoarces viviparus under short term hypoxia". Mar Ecol Prog Ser. 88: 181–184. doi:10.3354/meps088181.